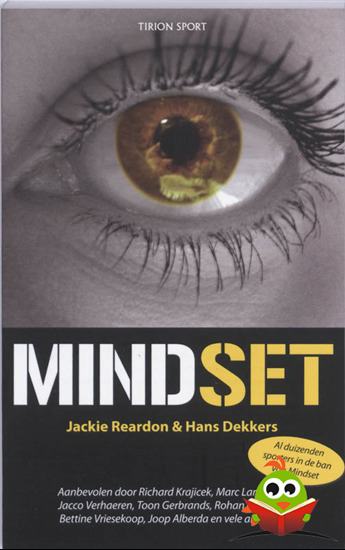 The Book Mindset is written for athletes and coaches of all levels, empowering them to systematically train the mental side of their discipline. It describes a new way of thinking, teaching how to convert impatience, tension and frustration into self-confidence and pleasure. The book has already taken Holland by storm. By changing your mindset, you will get the best out of yourself, and will be able to do far more than before with the same level of skill. Getting into a flow is within anyone's reach, provided you know what to focus on. Mindset provides you with the answers. 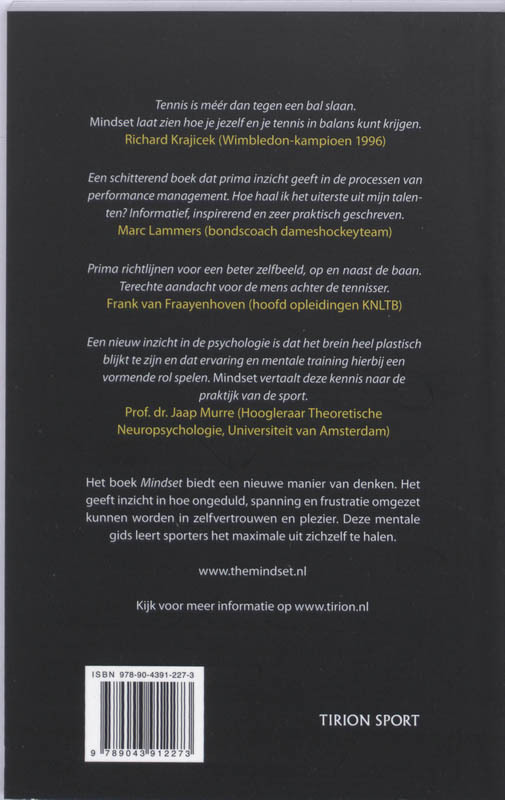 Here follow acknowledgements from famous sporters and coaches. 'Mindset reveals the secrets of heigtened awareness and focus in an excitingly new and practical way. Mindset can guide you in training the mental side of the game, whilst increasing your pleasure in sport. I thoroughly recommend the book. ' Darren Cahill (ex pro tennis player, Head of Adidas team, advisor of Novak Djokovic, Caroline Wozniacki and many other top players, US Open commentator) I agree with the Mindset vision and clear method. I'm convinced that players will gain insight into how they can improve the mental side of their game by reading this book. Leander Paes (ex world ranking nr. 1 doubles, multiple Grand Slam winner). A fantastic book that provides insight into the process of performance management. Shows you how to make the most of your talents. Written in an inspiring and informative way, and highly practical. Marc Lammers (coach of Dutch national womens hockey team, world champions in 2006, Olympic gold in Beijing 2008). There is more to tennis than hitting the ball. Mindset shows you how to get yourself and your tennis in balance. Richard Krajicek (Wimbledon champion 1996). A clear and accessible way of acquiring more self-knowledge and self-control, applicable at all levels of sport and other challenges in life. Jacco Verhaeren (coach of Dutch national swimming team, pupils: Inge de Bruijn and Pieter van den Hoogenband to Olympic gold in Sydney 2000 and Athens in 2004, and twice Olympic gold in Beijing in 2008).